Retail Math: The Most Important Formula in Online Retail! As a decision maker at an e-commerce company, there’s all sorts of retail math formulas you have to do to make sure everything is running as it should be (average inventory formula, retail markup calculation, average unit retail, etc). But there’s one retail math formula in particular that can best predict the success or failure of your company. The Holy Grail of retail math. This article will show you how to use it. What is the Online Retail Formula? Why is the Online Retail Formula Important? Keep your Customer Acquisition Cost (CAC) below your Customer Lifetime Value (LTV). Which makes sense; that’s basic retail math. Of course you want to pay less for your customers than you make from them. The tricky part is breaking the formula down, and using the insights you gain in an actionable way. First, let’s discuss why you should care about this formula, then we’ll break the formula down to examine the parts. Sure, you can have a rough idea of what you spend and what you make back without having to do the retail math, but there are tangible reasons to sit down and make this formula work for your business. The online retail formula isn’t just a matter of figuring out if your CAC is lower than your LTV. The difference between your CAC and LTV will inform you of how you should adjust your marketing spending. The larger your business grows, the more important the retail math formula becomes; you won’t always be able to use rough estimates. Once you start looking into how large and how quickly you can scale, you will want to know if, and by how much, you can increase your acquisition spending without going into the red. On the opposite end of that, you might find out that your CAC is too much lower than your LTV, meaning you aren’t spending enough on your customers. “The ideal CAC:LTV ratio is different for every industry, but the comfortable range is between 1:3 and 1:5. A ratio of 1:6+ is even better.“ 1:6 and up means your customer loyalty program is working brilliantly, your customer experience is near perfect, and overall you’ve honed and optimized your site just right. You should also consider that LTV is based on the average customer. If Apple started selling items that only 1% of the population could afford, their average LTV would be enormous; probably much higher than their CAC. However, it would be because the target group is smaller; not because they’re making more money. 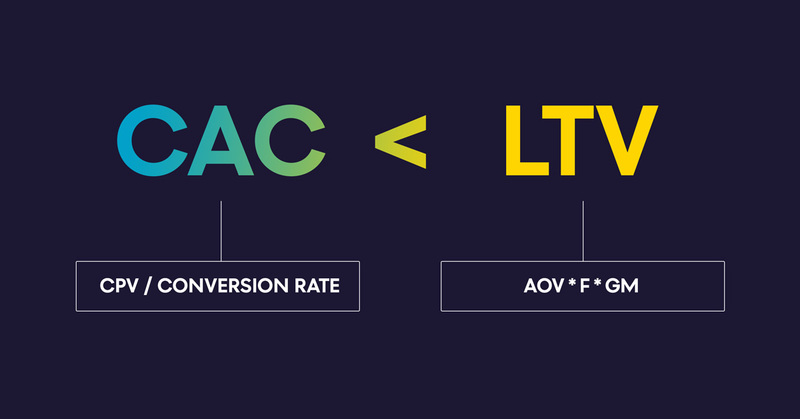 Solving this formula for your business gives you more than your CAC:LTV ratio. The variables you’ll need to define as you start piecing it together (Cost Per Visit, Gross Margin, Frequency, etc.) are valuable to be aware of as well. The process of solving this formula will change the way you look at your business, leading to a more customer-centric model for this customer-centric market. Your CAC is the total average cost to acquire and keep a customer for your business. Find your customer acquisition cost by dividing your Cost Per Visit (CPV) by your Conversion Rate (CR). (In this formula, we’re defining a conversion as the move from visitor to customer). One thing to make very clear here about finding your CPV: retention marketing is part of your total marketing costs. When finding your CPV, be sure you’re calculating the total cost of both acquiring your customers, and of keeping them around to fulfill their customer lifetime value. Let’s say it costs you an average of $0.10 per visit, and you generally convert 3% of your visitors. Your CAC is $3.33 per customer. This site has great resources for retail math, including a markdown calculator, retail margin calculator, retail sales calculator, and more. If you really want to get as precise as possible, remember to add the salary costs of any team members whose jobs are related to the sales or marketing. Your customer lifetime value is the total value of a customer’s interactions with your brand. Find your customer lifetime value by multiplying together your average order value (AOV); average purchase frequency rate (F); and gross margin (GM). Your LTV is $60 per customer. Our CAC is less than our LTV! Does that mean we’ve succeeded? Yes. But no. The first and most important rule is to keep your CAC below your LTV, but you don’t want the ratio to be too severe. 3.33 < 60 means our CAC:LTV ratio is nearly 1:20! While it’s better to have the ratio skewed in this direction, a finding this dramatic suggests you could have even greater success by spending more on your customers. You found your KPIs. You did the formula. Now what? If you went through the calculations and found out that your CAC:LTV ratio is perfect, then congratulations! If not, don’t panic: this is why we wanted to use the formula in the first place. Now that you’ve plugged in all the KPIs that make up the ratio, pick your weakest KPI and improve it. Focus on the “low-hanging fruit.” Rather than trying to make your above average areas perfect, find your worst performing areas, and focus on making them good. Is the problem that your Cost Per Visit is too high, or is your Conversion Rate too low? 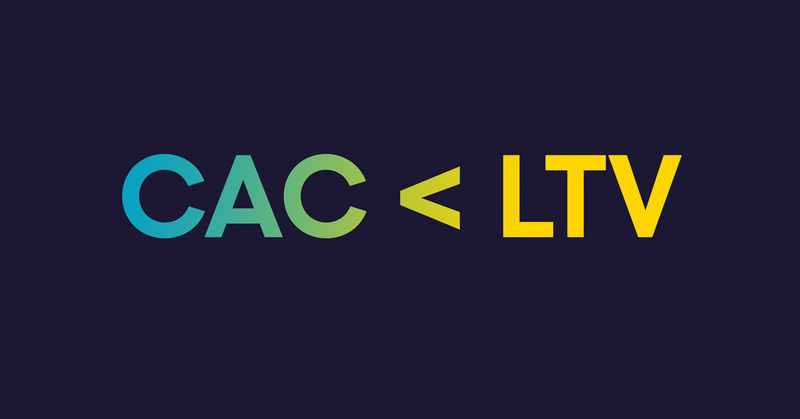 With the information you found while calculating your CAC:LTV ratio, you now know which area to focus on. If you’re interested in using retail math solutions to improve any area of your CAC:LTV ratio, schedule a free demo with Exponea, and we’ll get started.